Marsh Harbor Miami Blackfy Lodge Blackfy Lodge is at the center of Schooner Bay Village. Photo: Graham Hegamyer. Map Data: SIO, NOAA, U.S. Navy, NGA, GEBCO; Image: © 2013 TerraMetrics, U.S. Geological Survey. The bonefsh image is appropriate, given the serious bonefshing conditions. There's ofshore fshing, too, and regular trips dedicated to supplying opportunities the lodge ofers. Bones on fy is the house specialty. The lodge is fresh fsh for dinner. That catch goes to Blackfy's new chef, Devon Roker, who located in the new Bahamian village of Schooner Bay in Southern Abaco Island, a keeps guests satisfed with unique and varied presentations of the Bahamas' best place that is quickly becoming legendary among serious backcountry anglers. seafood. It's part of the lodge's unique, open-kitchen restaurant that focuses on "What we've found is basically a rarely fshed area where there are only a few ocean-to-table fare. Owner and general manager Capt. Clint, a native Bahamian, lodges at this time," says Vaughn. "The guides up north don't need to come this is also a top-fight chef in his own right and provides much of Blackfy's culinary far south, and the guys in the south don't need to come this far north, so that inspiration. 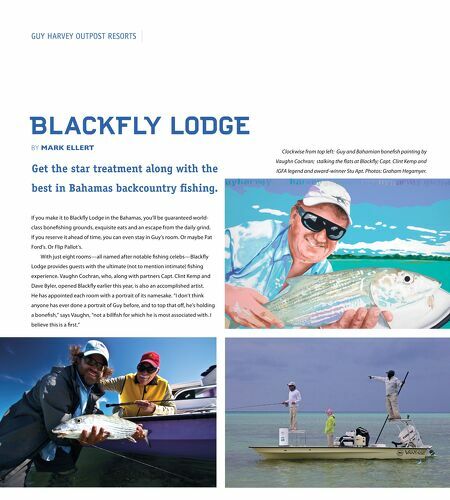 leaves us in the middle with Moore's Island and Gorda Key as the prize fshing Blackfy Lodge is the latest Guy Harvey Outpost to open. 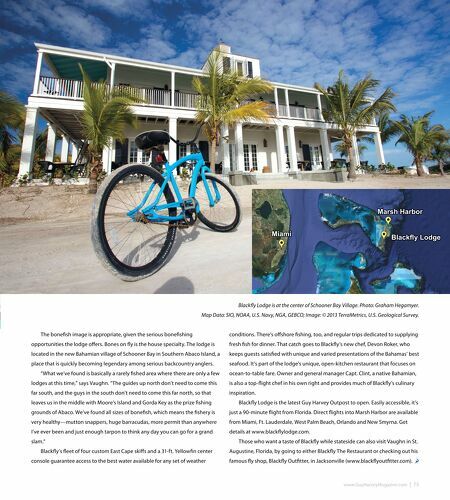 Easily accessible, it's grounds of Abaco. We've found all sizes of bonefsh, which means the fshery is just a 90-minute fight from Florida. Direct fights into Marsh Harbor are available very healthy—mutton snappers, huge barracudas, more permit than anywhere from Miami, Ft. Lauderdale, West Palm Beach, Orlando and New Smyrna. Get I've ever been and just enough tarpon to think any day you can go for a grand details at www.blackfylodge.com. slam." Blackfy's feet of four custom East Cape skifs and a 31-ft. Yellowfn center console guarantee access to the best water available for any set of weather Those who want a taste of Blackfy while stateside can also visit Vaughn in St. Augustine, Florida, by going to either Blackfy The Restaurant or checking out his famous fy shop, Blackfy Outftter, in Jacksonville (www.blackfyoutftter.com).